Many variables are used to assess fruit and vegetable quality. Some quality metrics such as size, shape, and color are relatively obvious and tend to influence "eye appeal." Others, such as flavor, texture, aroma, and nutrient content, however, are more subjective. They may also require sophisticated techniques and equipment to assess. In addition, these subjective metrics tend to influence more complicated aspects of product appeal, such as eating quality and nutritional value. Winemakers, vegetable processors, and many other members of the food industry use °Brix to describe sugar or soluble solids content. Quality-conscious buyers often pay specific attention to eating quality. A product's appearance may help sell it the first time but the enjoyment of eating it is usually required for repeat sales. An item's eating quality is based on its composition (physical, chemical makeup) and the consumer's unique sensory apparatus. In fact, eating quality is best assessed by trained panelists because the human olfactory system is superior to all other "technology" or systems in its ability to differentiate samples based on key sensory properties. Not surprisingly, companies rely heavily on panel testing, which is time-consuming and costly. Of course, farmers and produce managers and handlers cannot run extensive panel tests to identify which product(s) may please most of their customers most of the time. Instead, with instruction and experience, farmers and others can rely on proven indicators of quality and field-friendly tools for measuring them. The level of soluble solids in a fruit or vegetable influences how sweet it may taste. Just as yield is reported in pounds or tons per acre, soluble solids are usually reported in values of °Brix. °Brix values are important because they can be measured objectively and they relate to a subjective criterion that buyers and eaters use to assess vegetable quality—flavor or sweetness. When obtained and applied correctly, °Brix values can aid in variety selection, harvest scheduling, and other aspects of crop production including irrigation, fertility, and post-harvest management. Farmers and others should make special note that °Brix can be measured easily and reliably in the field, shop, or shed using a relatively inexpensive piece of equipment able to fit in most pockets: a refractometer. Four fact sheets have been prepared to guide farmers and produce buyers in using °Brix as an indicator of vegetable quality. This overview provides important background information on °Brix, outlines its application in horticultural crop production, and describes the benefits and limitations of measuring °Brix during vegetable production and marketing. Other fact sheets describe how °Brix can be measured and provide guidance in making the best use of the values obtained. As pounds are used to express weight, °Brix is used to express the level of soluble solids in a solution. Sugars, pectins, organic acids, and amino acids are the most prevalent soluble solids in fruit and vegetable juices and all of them contribute to °Brix values. However, sugars are the most abundant soluble solid in many fruit and vegetable juices. Therefore, °Brix values primarily represent estimates of sugar content in fruits and vegetables. Sugar content, of course, influences sweetness, an important component of consumer ratings of product quality. Still, it is important to note that sweetness can be overwhelmed by other aspects of flavor. Therefore, a high °Brix value does not guarantee a sweet flavor. The °Brix scale was developed in the mid-1800s by Adolf Brix. The scale is equal to the percent of dissolved solids in a solution. Therefore, a 100 g sample of a solution that measures 50° Brix has 50 g of sugar and other dissolved solids and 50 g of water. The °Brix scale first used a reference temperature of 15.5°C and now commonly uses a temperature of 20°C (68°F). °Brix values of a solution are measured using a device called a refractometer. Refractometers measure the refractive index of a solution to calculate a soluble solid concentration. Functionally, the refractive index quantifies dissolved solids based on changes in the direction of a light beam that passes through a liquid containing invisible dissolved or suspended solids. In general, the greater the amount of these "solids" in the liquid, the more light is bent when passing through it. All things being equal, the extent of this refraction also hinges on the temperature of the solution. Therefore, some refractometers adjust the values they report to account for the solution temperature. There are three major types of refractometers: analog handheld, digital handheld, and bench-top. Handheld refractometers are arguably the most convenient as they can be taken into the field for on-the-spot °Brix measurements. Handheld versions use either the sun or an enclosed bulb as their light source and have a gauge or digital display. Automatic digital refractometers used in laboratories and QA/QC facilities are more costly and not portable; however, they return data quickly, require little training, and can reduce operator error when taking readings. Many modern refractometers automatically adjust their displayed values according to the temperature of the sample. Older models may require the use of correction factors to obtain accurate results for samples taken at temperatures other than 20°C (68°F). This figure illustrates how a refractometer measures the changes in light used to determine soluble solids content and °Brix in a sample. Soluble solids levels influence the commercial use and consumer reaction to many fresh fruits and vegetables and their value-added products. This makes clear why °Brix is used throughout the produce, food, and beverage industries. Field managers use °Brix values to assess harvest readiness of grapes, melons, and other crops. Grocery stores and restaurant produce managers use °Brix values as an indicator of potential crop quality. 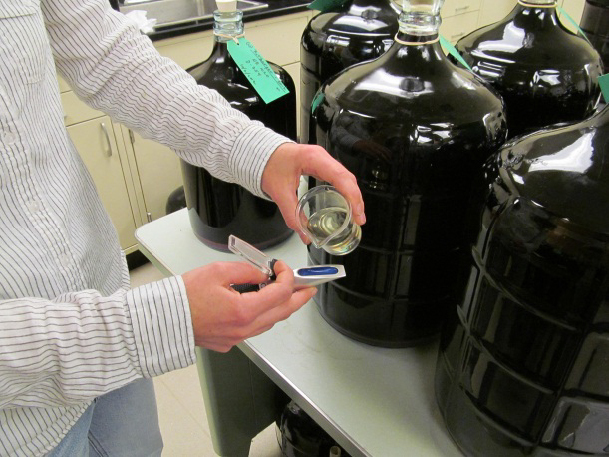 Buyers of crops used to make various products routinely measure °Brix of fresh or stored crops before they are used in the making of beer, wine, juice, sauce, refined sugar, and other products. In these situations, even small differences in °Brix values influence the bottom line. So, °Brix values are examined closely. For example, making tomato products such as sauces and pastes is energy intensive. Much of this energy is required to remove water from fresh tomato fruit. The higher the °Brix value, the less water in the fruit and the less energy needed to remove it. Likewise, the higher the °Brix value, the less sugar that may need to be added in the making of the value-added product. Regardless of whether °Brix influences the appeal of their crop based on flavor, processing, or other aspects of quality, crop managers benefit from learning more about how to measure °Brix and interpret readings. Fortunately, °Brix measurements are relatively easy and inexpensive. So, they can be taken often. In fact, measuring °Brix values regularly is recommended. Why? Partly because single values can be misleading and partly because having more values available helps crop managers to identify connections between °Brix values and conditions their crops experience. Many factors can influence °Brix values consistently and significantly. These factors include variety, maturity or growth stage, and water and fertility management. With practice and careful attention, it is possible to manipulate these and possibly other aspects of crop management to achieve target °Brix levels. Measuring °Brix can help vegetable growers to monitor and manage crop quality. Even so, the right amount of importance should be placed on °Brix values. Just as we would not use only our pulse to determine our health, °Brix values alone cannot describe the overall health of the crop, soil, or farm. Being familiar with the benefits and limitations of measuring °Brix is important. Soluble solids are used to determine optimum harvest time for wine grapes and as an assessment at other points during winemaking. °Brix levels are an important quality index of tomatoes harvested for processing (Image courtesy of Gene Miyao, University of California Cooperative Extension). Using a digital or analog refractometer to measure °Brix can benefit produce growers, managers, and handlers in three main ways. First, °Brix is a straightforward, objective, and relatively inexpensive measurement. Refractometers are inexpensive compared to other key farm tools. °Brix can be measured simply and reliably in the field or work area. Second, °Brix values can allow growers and others to compare varieties and production practices across farms, harvest dates, years, and seasons. Third, °Brix values are an estimate of the sugar content of a sample. Sugar content is known to influence the consumer acceptability of many fruit and vegetable products. Measuring °Brix can be very useful. However, growers and others should recall three key limitations of the practice. First, °Brix measurements are only as strong as the sampling procedure and instrument that produced them. Poor or inconsistent sample selection or measurement will lead to poor results. Also, keeping refractometers in good working order is important for accurate °Brix readings. Second, many genetic and management factors interact to influence crop °Brix levels. Similar varieties and management (e.g., fertility, irrigation) will not always result in similar °Brix values. For example, °Brix values of crops "on the vine" or in the field change throughout the day; so, measuring °Brix at the same time each time is important in order to compare varieties, fields, crops, etc. Research has shown that management can impact °Brix in predictable ways. However, °Brix values will vary with year, season, environment, and other factors. °Brix readings are most useful when they are taken often in order to identify trends. Third, sugar content is only one factor that contributes to the overall quality of a crop. °Brix can be an accurate, repeatable, and easily obtained measure of soluble solids in crops. However, the relationship of °Brix to human taste perception is more direct in some crops than in others. Sugars, many other compounds, and eater preferences determine how sweet a sample may taste and its appeal. Therefore, crops with the highest °Brix reading will not necessarily taste sweetest or best. Also, °Brix values are not a direct measure of the nutritional value of a crop as dieticians, nutritionists, and other professionals assess it. Complex analytical procedures are required to measure the nutritive value of food, which is based on many components (USDA). °Brix levels can correlate with some accepted components of nutritive value. However, there is currently no solid scientific evidence that °Brix values alone can be used to describe a food's nutritional value. This overview provides important background information on °Brix, outlines its application in horticultural crop production, and describes the benefits and limitations of measuring °Brix during vegetable production and marketing. Other fact sheets describe how °Brix can be measured and provide guidance in making the best use of the values obtained. Making the best use of °Brix measurements requires time, patience, and practice. A solid record of °Brix values obtained on multiple crops (varieties, years, growing conditions) is needed to use °Brix values in decision-making. Ball, D. W. 2006. Concentration scales for sugar solutions. J. Chem. Ed. 83:1489–1491. Boulton, R. B., V. L. Singleton, L. F. Bisson, and R. E. Kunkee. 1996. Principles and practices of winemaking. Chapman and Hall, NY. Kader, A. A. 2002. Quality and safety factors: Definition and evaluation for fresh horticultural crops. p. 279–286. In: A.A. Kader (ed). Postharvest technology of horticultural crops, 3rd Ed. Univ. Cal. Agr. Nat. Res. Pub. 3311. Mitcham, B., M. Cantwell, and A. Kader. 1996. Methods for determining quality of fresh commodities. Perishables Handling Newsletter 85:1–5. Refractometer Scales—Misconceptions. Bellingham + Stanley. Tech Bull no. R016. United States Department of Agriculture. Nutrient Database for Standard Reference. ndb.nal.usda.gov/. The technical contributions of Stephanie Short and Danae Wolfe to the development of this fact sheet are appreciated.